Bidets have been common in European bathrooms for years. Over the past 20 years the bidet has become a more accepted feature in bathrooms in the United States. This is especially true in bathrooms in more upscale houses. The space required for a bidet depends on the type of bidet desired by the homeowner. Bidets come as separate units or as units that attach to a toilet. A separate bidet takes about the same amount of room as a toilet. According to the National Kitchen and Bath Association (NKBA), the code requirement for the minimum space between a wall or other appliance and the center-line of a toilet or bidet is 15 inches. The NKBA, however, recommends 18 inches rather than 15 inches to give users more space. Additionally, bidet installations require a minimum 21 inches clear space in front of the front edge of the appliance with a recommended 30-inch space if possible. The larger and more luxurious the bathroom the more space that can be given for each appliance. When measuring a bidet make sure to consider the exterior fixtures. Some bidets have fixtures that extend beyond the basin. Additionally, when ordering a bidet make sure to consider the design and color of the fixtures. 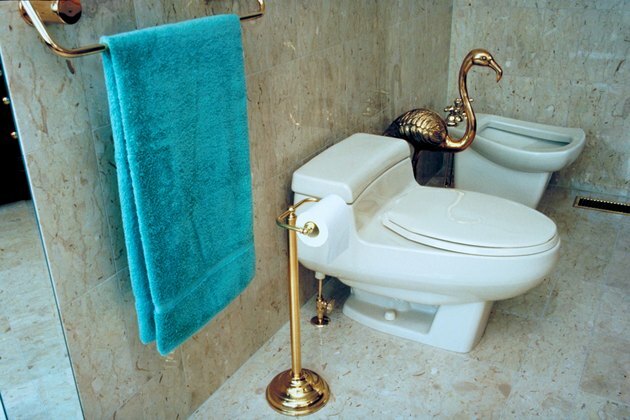 Ideally, the fixtures should match those on the toilet and sink. Most basic bidets are very easy to install. Any plumber or advanced amateur should be able to make the installation. Some bidets, however, could have advanced features such as water heaters. These require a much more difficult installation and take more room. Make sure to interview the plumbing contractor thoroughly to determine if he has the required expertise to make the installation. A homeowner may desire a bidet but not have space for a separate unit. Many manufacturers supply a bidet that can be attached to the existing toilet. This option gives the homeowner the convenience of having a bidet even if there is only room for a toilet in the bathroom. Most of these units can be installed by almost any homeowner. How Big Is the Average Bathroom? What Is a 1/4 Bath?